Drones at SU from Syracuse University News on Vimeo. Central New York will soon be a hub for testing and research in the rapidly growing field of drone aircraft—and Syracuse University researchers will play a critical role in the advancement and implementation of unmanned aircraft systems. The Federal Aviation Administration (FAA) announced Dec. 30 that a regional partnership of organizations in New York and Massachusetts will operate one of six test sites in the United States for the development of unmanned aircraft systems (UAS), commonly known as drones. Test sites will conduct research to help develop standards to safely integrate UAS into the national airspace. Griffiss International Airport, operated by Oneida County, will direct UAS test site operations in partnership with the Northeast UAS Airspace Integration Research Alliance (NUAIR), a consortium of public entities, private industry and academic institutions, including Syracuse University. U.S. Sen. Charles Schumer attended a news conference at Manley Field House Friday, Jan. 3, to further expand on what this designation means and the potential economic impact on the region. “The selection of the sites is like the Wright brothers starting their airplane,” said Sen. Schumer. “We’re at a dawn of a new era, and we are in the door first (to) create the kind of jobs we need in Central New York. They’re going to change the way people do business, and create millions of jobs.” It’s estimated the drone industry will be an $82 billion dollar business. 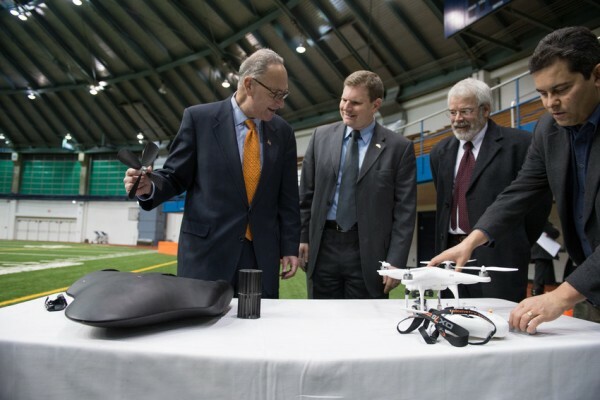 During Schumer’s press conference, Professor Dan Pacheco, the Newhouse School’s Peter A. Horvitz Endowed Chair of Journalism Innovation, demonstrated the use of drones for journalistic purposes inside Manley Field House. Pacheco, who has been in consultation with NUAIR about drone journalism for the last year, has experimented with drones in regard to aerial footage and spoke about them in a seminar series last year. UAS currently perform border and port surveillance, help with scientific research and environmental monitoring, support public safety by law enforcement agencies and support various other missions for government agencies, according to the FAA. SU, along with the Center for Advanced Systems and Engineering (CASE) at SU, a New York State Center for Advanced Technology, has been engaged for several years in federally funded and industrially funded research that has far-reaching implications for the development of UAS and unmanned aerial vehicles (UAVs). In the College of Engineering and Computer Science, researchers in electrical engineering, computer science and aerospace engineering are eagerly anticipating the additional research opportunities that will likely be created as a result of the FAA’s decision. “Current and future drone systems will benefit greatly from at least two of the current focus areas—cognitive wireless systems and networks and cybersecurity—in the College of Engineering and Computer Science,” says Mark Glauser, associate dean for research and doctoral programs and a professor of mechanical and aerospace engineering. “Cognitive wireless systems and networks will be crucial for communication among drones and controllers,” says Pramod K. Varshney, Distinguished Professor of Electrical Engineering and Computer Science and director of CASE. Cybersecurity research is also vital in preventing attacks by hackers and for mission assurance. “Other areas of research include information fusion, sensor management, and tracking and detection to improve situational awareness so that UAVs can use ‘sense and avoid’ methods,” Varshney says. Also in the College of Engineering and Computer Science, the Department of Mechanical and Aerospace Engineering is home to funded research in fluid dynamics, turbulence, active flow control, system optimization of UAVs and energy systems. Other work will also include continued collaborations with the Air Force Research Laboratory in Rome and private sector defense contractors in such areas as radar and digital signal processing, communications engineering, radar/sonar systems, cybersecurity, wireless networking and mobile computing. In both the biomedical and chemical engineering and civil and environmental engineering departments, faculty members are conducting applied research into lightweight, durable materials with shape memory that can enhance capabilities and durability of UAVs. Researchers are looking forward to other ventures in the future. In other SU schools and colleges, faculty members in the Department of Mathematics in The College of Arts and Sciences conduct research on image and signal processing and optimization, important facets for UAS. In addition, the joint College of Law and Maxwell School of Citizenship and Public Affairs’ Institute for National Security and Counterterrorism is involved in policy research directly related to UAS. Its work includes a project called “Rise of the Drones” that explores the legal issues surrounding UAS, and several active cybersecurity and information assurance research projects. Along with conducting research, SU’s schools and colleges are creating opportunities for students to learn about the latest in drone technologies and capabilities. According to Glauser, the College of Engineering and Computer Science is exploring an undergraduate minor in drones and he and Senior Associate Dean for Academic and Student Affairs Can Isik have already developed a framework for such a minor. In addition, the college is considering the possibility of a certificate of advanced studies or master of science program. Newhouse Associate Dean Hub Brown, an associate professor of broadcast and digital journalism, says he and his colleagues are partnering with the College of Engineering and Computer Science to allow students the opportunity to work together to design and produce purpose-built drones for journalism.